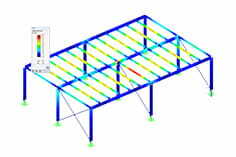 RFEM and RSTAB allow you to easily consider wind load effects on a three-dimensional building according to ASCE/SEI 7‑16 . This article explains the complex theory of entering wind loads in the software. You can find the wind load under 'Tools' → 'Generate Loads' → 'From Wind Loads'. These general parameters for the determination of velocity pressure are required in the upper part of the dialog box (see Figure 01). Next, the base and roof geometry have to be entered (see Figure 01 in the middle). In the case of a flat roof, the nodes A and I, B and J, C and K, as well as D and L must rest below each other. In the case of a duopitch roof, the same applies to the nodes A and I, C and J, D and K, as well as F and L. Furthermore, the wind direction should be set on the respective building side. Due to the various cases (see ASCE/SEI 7‑16, Fig. 27.3-8) to be examined, you must always define two building sides. 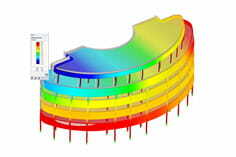 Case 1: Full design wind pressure acting on the projected area perpendicular to each principal axis of the structure, considered separately along each principal axis. Case 3: Wind loading as defined in Case 1, but considered to act simultaneously at 75% of the specified value. According to ASCE/SEI 7‑16, Table 26.13-1, Note 3, the internal pressure coefficient (GCpi) must be considered positively and negatively in order to take into account the most unfavourable load position. Various signs are indicated by the index +cpi and -cpi in the load cases (see Figure 02, highlighted in yellow and red). Since the wind pressure changes quickly between positive and negative values for the wind direction right-angled to ridge, two values for the external pressure coefficient are specified in ASCE/SEI 7‑16, Fig. 27.3-1. Both must be checked according to Note 3. This is indicated in the dialog box by the index w1 and w2 (see Figure 02, highlighted in purple and green). Basically, all constellations have to be analysed in order to find the most unfavourable state. If you want to exclude the non-governing load cases, you can deactivate the load cases by unchecking the relevant checkbox. In the bottom part of the dialog box (see Figure 01), you can specify settings regarding the load distribution. This is explained in detail in the RFEM manual , Chapter 11.8. ASCE/SEI 7‑16. Minimum Design Loads and Associated Criteria for Buildings and Other Structures. (2017). American Society of Civil Engineers.